A visit to Arabica Café feels like walking into a good friends home. Heavenly scents of freshly baked pastries and bold roasted coffee will greet you from the moment you arrive. 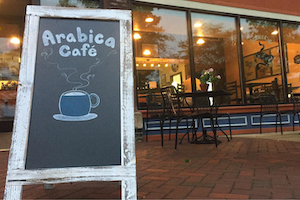 Husband and wife, Brian and Diane Stanton opened Arabica Café in 2016 as a specialty coffee house offering superior quality brews and pastries baked from scratch, such as their wildly popular Cyclone. Arabica Cafe Pastries are Baked Fresh Every Day! Mac & Cheese with a Twister at Arabica Cafe. The Arabica Cyclone is their unique adaptation of a cinnamon roll. It’s perfectly baked to puff-up in the shape of a cyclone, hence the name! The cafe features a variety of freshly baked specialties, rotated daily to ensure you’ll always have choices from the sweet and savory, in traditional and gluten-free options. Chef Brian noted that about 25% of the bakery case is filled with gluten-free items such as scones, cookies and macaroons. Chef Brian is passionate about his craft and shares his culinary talents with special creations like his Ciabatta Short Rib Sandwich or seasonal Maple Pecan Scones. “I create specials based on the season. Fresh salads in the summer and open-faced hot sandwiches in the winter.” Other menu offerings include sandwiches for breakfast and lunch plus healthy salads. 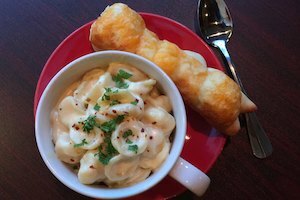 They also offer gourmet mac & cheese and home-made soups served with a fresh-baked “twister”, otherwise known as one outstanding breadstick! 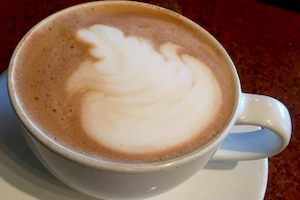 Try a Latte at Arabica Cafe. Arabica serves coffee roasts from Bridgetown Coffee of Portland, Oregon. Just like wine, different roasts pair with different foods. For instance, a mild roast pairs nicely with their Lemon Bar or Almond Tea Cookie. Likewise, a strong roast is perfect with their decadent Double Fudge Brownie or savory Spinach & Gruyere Scone. Diane noted they choose Bridgetown for their excellent taste in a wide variety of flavors. A special “Guest Roaster” program is also available to give customers the opportunity to try a sample from local roasters such as Maple Leaf Coffee Roasters from Roselle, Tugboat Coffee of Addison and Metropolis Coffee of Chicago, just to name a few. Visitors can purchase items to enjoy at home such as Chicago-based Benjamin Tea products, Saad’s Bee’s honey from Elgin, Sanctuary Chai teas and a variety of Bridgetown Coffee whole bean roasts. Online Ordering for local pick-up is also available and special orders are accepted for larger quantities, ideal for business meetings or group events. Prior to opening Arabica Café, the Stantons owned Cinnamon Cyclones for 10 years. The coffee house and bakery in Bakersfield, California is where their popular “Cyclone” really took off! Since then they settled in Elgin and are excited to be part of the Downtown Elgin community. Today, Arabica Café is thriving with a strong group of regular patrons who appreciate their exceptional quality and friendly service. Stop in today for a Carmel Macchiato and their famous Cyclone!